Help put the life-transforming Word of God in the hands of men, women and children all over the world. Your gift below will fuel the 2018 Summer Surge goal of giving 10,000,000 people access to the Bible in their heart language! You'll help provide vital translations to reach those who don’t yet have access to the Bible in a language they can understand. You'll help create format diversity so those suffering from persecution or restricted by illiteracy or poverty can access God’s Word in new digital and print formats. You'll help extend global distribution networks, so God’s Word can reach every corner of the globe. 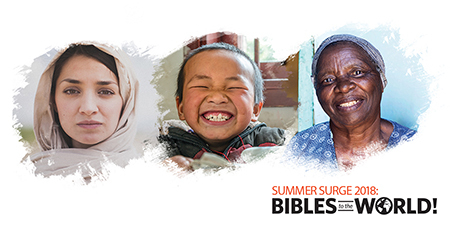 Thank you for your generous support to take Bibles to the World through the 2018 Summer Surge campaign. You’ll help make God’s Word accessible across the world so that all may be transformed by His love, Truth, and hope! If you prefer to donate to a different project, feel free to note which one in the comments box below.